Obama's Lunch: Sandwich With A Side Of Shutdown Messaging : It's All Politics President Obama sought to turn an "impromptu" lunchtime stroll into a chance to neutralize a damaging shutdown quote from an administration official. 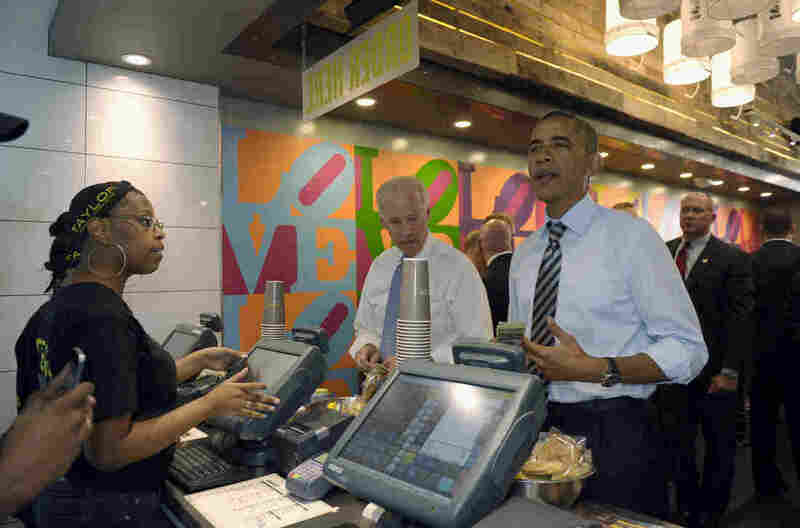 President Obama and Vice President Biden at Taylor Gourmet sandwich shop near the White House on Friday. Before President Obama canceled his Asia trip, some of us wondered how he could possibly leave the U.S., especially for the exotic resort island of Bali, during the federal government shutdown. Forget the logistical complications caused by having so many staffers unable to work the trip. What about the optics of having the president at a lush tourist destination while hundreds of thousands of government workers were furloughed and worried about missing paychecks? Obama solved that potential problem by canceling his overseas trip, which would have started Saturday evening. So how might the president fill the coming week when he had expected to be in Asia? Friday might have given us some indication. Obama and Vice President Biden surprised the White House press corps and lunchtime pedestrians by strolling from the White House to a local lunch spot and ordering up some sandwiches, just like regular folks. "Part of the reason we're here is we're starving," the president said. "The other reason we're here is that right now this establishment is providing a 10 percent discount to all federal workers who are on furlough. ... And that I think is an indication of how ordinary Americans look out for each other and aren't obsessed with politics and aren't trying to extract concessions from each other." Many Washington retailers are using such discounts to entice suddenly frugal government workers to keep spending, so it's not all about altruism, of course. But that would have been off the message Obama aimed to deliver while mingling with average citizens. "Said a senior administration official: 'We are winning...It doesn't really matter to us' how long the shutdown lasts 'because what matters is the end result.' "
The impromptu stroll allowed the president to be in a position in which a journalist could ask him about that. It's a standard tool in the political messaging tool kit. A journalist did ask, allowing the president to respond: "There's no winning when families don't have certainty about [whether] they're going to get paid or not ..."
That's was one large side order of messaging with the president's sandwich.